Il Balcone has two bedrooms, a bigger one with a double bed and the smaller one has two single beds. The local cottage 'Il Giardino' has two apartments and a huge garden. 'Il Balcone' has a balcony a Pergola in the garden and 'Le Volte' a little terrace in front of the house and a big terrace in the garden. The guests of both apartments can use the garden. There is a Pergola which can be used of the guests of 'Il Balcone' and the terrace can be used of the guests of 'Le Volte'. In the immediate vicinity of the house is a public sports field with two tennis courts. Within a few minutes walking distance are all the shops, supermarkets, a pharmacy, dry cleaners, bars and restaurants and a nearby swimming pool. Sesta Godano is a typical Ligurian village inland, 19 km from the picturesque coast of Liguria, Levanto and the Cinque Terre. The area around Sesta Godano, Val di Vara, is marked by green, densely wooded hills and rivers and Gottero Vara. The Monte Gottero, the highest mountain, (1,639 m) is ideal for mountain biking and hiking. 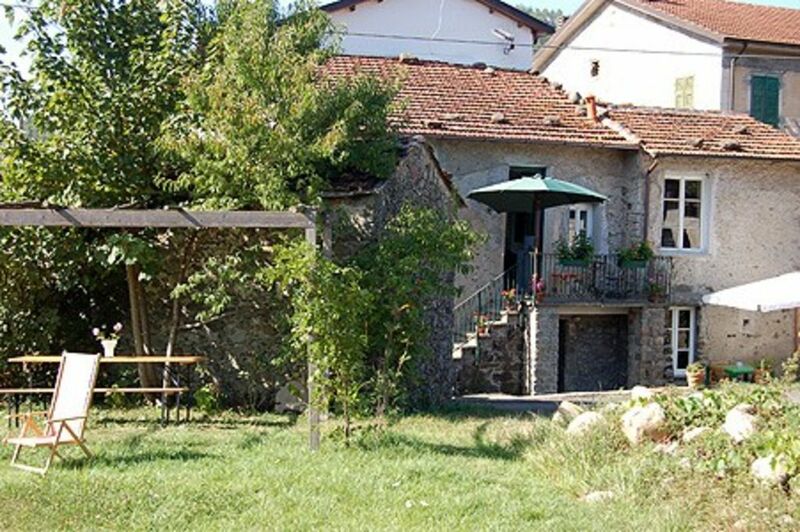 In April, my husband and I along with another couple stayed in Sesta Godano. This was our home base whilst we explored Cinque Terra during the days. Cinque Terra was great but everything is built on top of another. Sesta Godano was a more quaint area and wonderful to return to in the evenings. The owner, Annette, was very helpful with information on the area and the house. The evening we arrived, the house keeper was waiting for us with the keys and to cover the basic information. That evening we walked into town and had a nice dinner of traditional Italian food (pasta and pizza). The following two evenings we ate at the house. This allowed us to catch the sunsets and to enjoy a small outdoor fire as the evenings cooled down. We would describe Sesta Godano as rustic, peaceful, and out in the country, but a great retreat at the end of the day. Usually the 1st person up made the coffee and enjoyed it on the small front porch. An additional perk was a dedicated spot to park the car at the house. La maison est super avec le petit terrain en face pour jouer ou se détendre. Nous avons passé un séjour correct, mais nous sommes un peu déçus. Les photos prises du jardin extérieur cache la petite rue qui passe entre la maison et le jardin. Or celle-ci peut-être bruyante, certains soirs, puisque des jeunes en moto (motos de 125 cm3) passaient en faisant hurler leur engins. Idem pour qqs triporteurs bruyants également. Les lits sont bons, l'appartement est rafraîchissant par rapport à la température extérieure à cette époque de l'année. Mais la cuisine est équipée de façon incomplète (pas de micro-onde, pas de cafetière électrique et pas de four vraiment utilisable, cuisinière très vieille). En plus un parking très étroit à partager avec deux autres locations...De fait, le prix pour deux semaines est excessif pour la prestation offerte, surtout quand vous arrivez après 775 km et que l'on vous réclame caution, les montants pour le chien et le nettoyage final! Die Wohnung ist sehr geschmackvoll eingerichtet; tolles Bad und prima Küche mit Gasherd. Für Kinder ist zudem die große Rasenfläche super. Wir waren rundum zufrieden!! The 'Rivera di Levante' east of Genoa is one of the finest pieces of Italian Rivera with densely wooded hills and mountains, deep coves and picturesque villages and towns by the sea. Sesta Godano, a quiet and natural market town in the inland, is located 17 km from Levanto, a lively town with a wide sandy beach on the Ligurian coast. Bonassola, a few minutes away from Levanto, located in a densely-covered valley, which opens out to the sea and a beautiful bay. The Cinque Terre, one of the most famous and most beautiful tourist destinations for hikers, a few minutes from Levanto train station. Equally attractive focal points on the sea Sestri Levante, Lerici, Porto Venere, also because of the excellent Ligurian cuisine, which is taken from the sea. Lucca and Pisa, are 1 hour away in car, Florence is about 1.5 hours. Final cleaning extra: 40 € in cash upon arrival / Endreinigung extra: 40 € in bar bei Ankunft. safety depoit: 100 € in cash upon arrival / Kaution: 100 € in bar bei Ankunft Dogs extra: 30 € / Hunde extra: 30 € Bedlinen and towels on demand: € 15 / pers. / Service der Bettwäsche und Handtücher auf Anfrage: € 15/ Pers. heating costs: € 40 (only in case of consumption; October to April) Heizkosten: € 40 (nur bei Gebrauch; Oktober bis April) ----------------------------------------------------- Wir bitten Sie um Verständnis, dass in der Hochsaison nur nach dem Wochen- und nicht nach dem Tagespreis gerechnet werden kann. Also bei einer Buchung von 13 Tagen würden wir dennoch 14 Tage berechnen. Danke. We hope of your comprehension that in high season we calculate only per week and not according the daily price. For example a booking of 13 days will be calculated still with 14 days. Thank you.